PHOENIX – Six parcels totaling about 81 acres of State Trust Land will be auctioned by the Arizona State Land Department in November, Arizona State Land Commissioner Lisa A. Atkins said today. If all six are successfully auctioned, the appraised value of at least $14.26 million would be invested in the State’s Permanent Land Endowment Fund for the benefit of K-12 public education, Commissioner Atkins said. Five parcels totaling of about 30 acres near Tucson Mountain Park southwest of Tucson will be auctioned at 11 a.m. Tuesday, Nov. 6. The auction will be held at Herbert K. Abrams Public Health Center, 3950 S. Country Club Road, Tucson. The minimum bid for all five parcels will be $259,000, their combined appraised value. If there are no bidders for the combined parcels, the individual parcels will be auctioned. The appraised values for each individual parcel may be found at https://www.azland.gov/upcoming-auctions. Any successful bid amount from this sale will be deposited into an account of the Permanent Land Endowment Trust Fund at the Office of the Arizona State Treasurer. The account is designated for K-12 public education. A parcel consisting of about 51 acres west of 40th Street and south of Loop 202 in Phoenix will be auctioned at 11 a.m. Wednesday, Nov. 7. 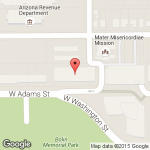 The auction will be held in the auditorium at the Arizona State Land Department, 1616 W. Adams St., Phoenix. The minimum bid on this land will be its appraised value of $14 million. A successful bid amount from this sale will be deposited into an account of the Permanent Land Endowment Trust Fund at the Office of the Arizona State Treasurer. The account is designated for K-12 public education. Both auctions are open to the public. Official notices for each auction containing bidding information, as well as a schedule of upcoming auctions, is available at https://www.azland.gov/upcoming-auctions.